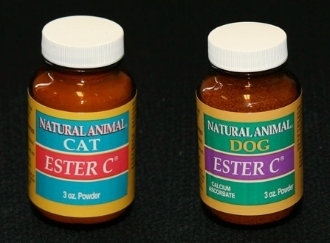 Natural Animal's Ester-C for dogs goes way beyond standard Vitamin-C. You will normally see results in as little as seven to ten days. For added mobility, especially in older animals, Ester-C gives your pet an edge. Ingredients: Ester-C (as calcium abscorbate), Calcium and Vegetable Source Fiber. Copyright © 2011-2019 Natural Animal Health Products, Inc. All rights reserved.